Enrico Fermi is unquestionably among the greats of the world's physicists, the most famous Italian scientist since Galileo. Called the Pope by his peers, he was regarded as infallible in his instincts and research. His discoveries changed our world; they led to weapons of mass destruction and conversely to life-saving medical interventions. This unassuming man struggled with issues relevant today, such as the threat of nuclear annihilation and the relationship of science to politics. Fleeing Fascism and anti-Semitism, Fermi became a leading figure in America's most secret project: building the atomic bomb. The last physicist who mastered all branches of the discipline, Fermi was a rare mixture of theorist and experimentalist. His rich legacy encompasses key advances in fields as diverse as comic rays, nuclear technology, and early computers. 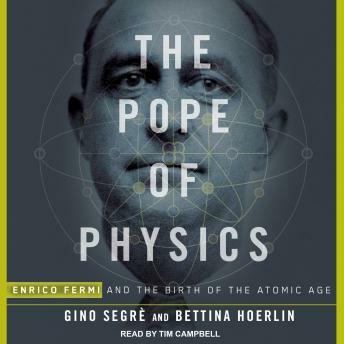 In their revealing book, The Pope of Physics, Gino Segre and Bettina Hoerlin bring this scientific visionary to life. An examination of the human dramas that touched Fermi's life as well as a thrilling history of scientific innovation in the twentieth century, this is the comprehensive biography that Fermi deserves.